Thank you for visiting TJ Signs Screen Printing and Embroidery. 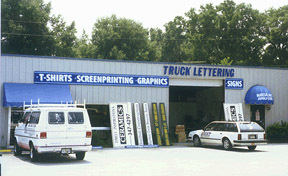 TJ Signs Screen Printing and Embroidery has been serving Ocala, Belleview and Central Florida. for over 20 years. We can also ship products outside the state of Florida. We would like to thank all our clients for trusting us to provide them with advertising products to promote their businesses and we also welcome new customers. We have a long history of experience in the field of commercial advertising which covers a wide spectrum. We specialize in design work, t-shirts, bumper stickers, banners, vehicle and boat lettering and now we also offer embroidery and monogramming. TJ Signs Screen Printing and Embroidery is owned and operated by Terry and Jose Rodriguez. Terry handles most if not all the operations of TJ Signs & Screen Printing. Jose Rodriguez is mainly the graphic designer. Together Terry and Jose make an awesome team taking care of our customers. Thank you for visiting and we are looking forward to doing business with you real soon.